Martin Gillespie joined Slow Food Aberdeen City & Shire in May 2016 and joined the committee in July 2016. As the owner and managing director of a busy non-food related business, Martin Gillespie spends much of his spare time promoting (and sampling) the fantastic products from the North East’s natural larder. He is not adverse to picking and consuming the food grown in his own garden or indulging on the honey from his own and other beekeepers hives! 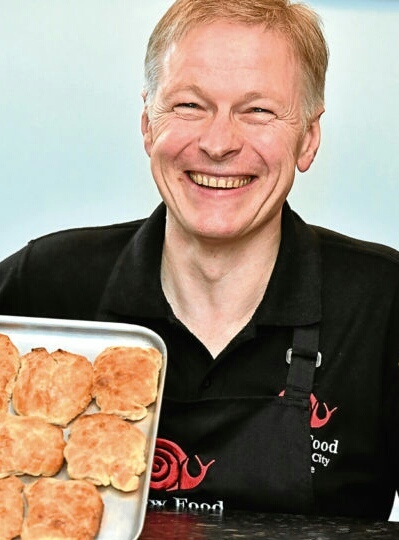 In 2018, to celebrate the boarding of the Traditional Aberdeen Buttery to the Slow Food Ark of Taste, Martin organised the first World Buttery Championship which took place at NESCOL in Aberdeen on the 16th June. Finalists were chosen from all the applications and they took part in a “Great Buttery Bake Off” to find the best buttery in the world.